In the first part, we established the key foundations of dealing with others, be it through coaching or in other kinds of relationship or setting that involves communication.In the second part, we focused on understanding ourselves as well as others better through developing self-awareness and emotional intelligence. This fifth part will focus on the core communication skills & language patterns which are essential to becoming a better listener as well as communicator. This will lay the foundation for developing trust, the key to any kind of relationship. Through what kind of lenses do people perceive the world? How to make sure I fully understand the other person? How do I make my true intentions clear? These questions and many others will be answered in this article. Enjoy! Our perceived quality of life is directly influenced by the quality of our relationships. And it is good communication that allows us to deepen our relationships and build trust. However, as we are imperfect communicators, it is often not that easy to understand the person you are interacting with and make sure you build and preserve trust. That’s why it is so important to improve the ability for good communication. This article only provides some insights and is by no means exhaustive, but may serve as a starting point. By realizing that people have different preferences to make sense of the world, we can avoid the trap of judging people too quickly, which is crucial for developing trust. Where is judgment coming from? Judgment ultimately stems from failing to keep in mind that at the core we are all the same. It is a form of ego-protection that aims to make us feel better about ourselves by trying to convince us that we are better or the other person worse. There is also the tendency to judge yourself by putting other people on a pedestal and only see what they do better than you. Therefore, on a personal level, focus in seeing other people as equals. You are neither better, nor worse, you can learn from everybody. And so the other person can learn from you. Equality, respect and trust are what efficient collaborations and communication are built upon. Another reason for judgment and the failure of good communication in general is the misinterpretation of the original intention. 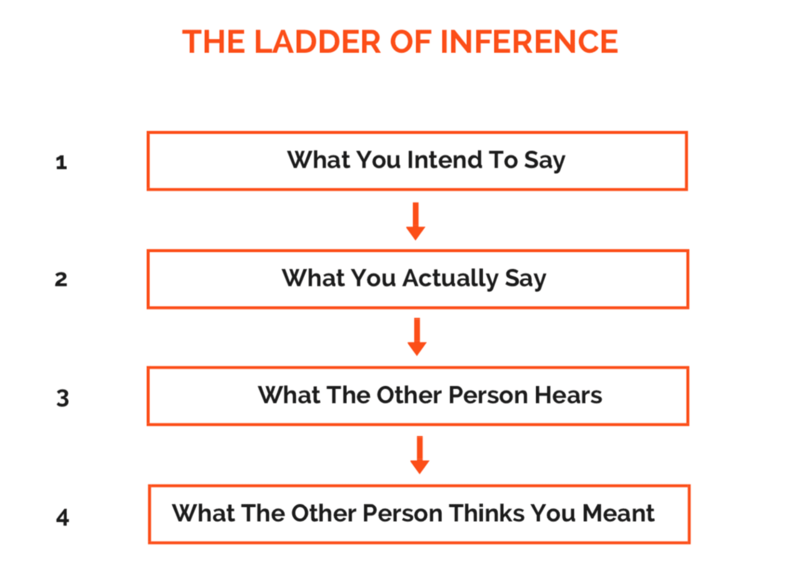 To understand the process of communication, business theorist Chris Argyris developed a framework called The Ladder of Inference. This tool shows the steps a message goes through and how your original intention can differ to what the other person thinks you mean. Understanding these stages and becoming aware of your current position on the ladder can help avoid jumping to wrong conclusions. Starting at the top of the ladder, we start by forming a thought about what we want to say. If we are not consciously aware of our intentions, we might react to impulses and say something completely different to our intentions. This is the second rung of the ladder, what we are actually saying. As we are imperfect communicators, what we are saying often still differs from our intentions, even if we are aware of them. The third rung of the ladder, what the other person hears might differ again from what you said, depending on disturbing factors or whether the other person is listening or paying attention. Finally, at the bottom of the ladder, the other person uses what she thinks we meant from what she heard us saying to jump to conclusions about our intentions. An example of how this conclusion can be totally different to the initial intention is when feedback given to a colleague, which was meant in a constructive way, is taken negatively and to heart, resulting in the other person’s conclusion that she is bad at her job. This ladder is of course influenced by our beliefs and the specific meta-programming as described above. So how to make sure we communicate and understand the real intentions? Firstly, an open mind and the awareness to avoid quick judgment about the other person’s intentions is crucial. Am I being selective about what I hear? Interpreting what I think the other person means? Making or testing assumptions? Forming or testing conclusions? Deciding what to do and why? Why did I draw this conclusion? Is the conclusion sound? What am I assuming, and why? Are my assumptions accurate? What data have I chosen to use and why? What are the real facts that I should be using? Are there other points I could consider? Having this self-control and patience to figure out the real intentions is what makes communication effective. In order to become effective communicators, it is essential to focus on fully understanding the other person first before trying to be understood. This seems to be a difficult task since it’s easy to try to make sure we get our points across. What is actually necessary is that we listen twice as much as we speak and thereby focus on understanding the complete message the other person is trying to communicate. Therefore it is key to be able to remain silent and give our undivided attention to the person we are listening to. The factors that impede listening and learning from Part 1 are important to consider. Keeping your attention on one thing can be trained through meditation, regularly exposing yourself to absolute silence and a distraction-free environment and shifting your work approach to single-tasking. Furthermore, check out this link for further tips on how to become a better listener. Ignoring: When we’re not listening at all. Pretending: When we’re trying to show someone that we’re interested, but we actually aren’t. Selective listening: When we only hear what we expect to hear. Attentive listening: When we pay close attention to what someone is saying to us. Active (Empathic) listening: When we focus on listening to what someone else is trying to say to us. The final stage of listening is where the most effective communication can take place. For “active listening” it is required to give your full concentration to what is being said as supposed to just passively “hearing” the message of the other person. Active listening is a skill that can be developed with practice. However, it can be challenging to master and requires time and patience to develop. Below are the signs that show if active listening is taking place. Try to see if you adopt these while you are listening. Smiling: Combined with nods of the head, smiling can be very powerful in affirming that you are listening to and understanding what the other person is communicating. Maintaining Eye Contact: This might encourage the speaker as it demonstrates that you’re interested in what’s being said. However, some people can find this intimidating, so discern how much eye contact is appropriate in each situation. Posture: Maintain an open posture that shows that you are present. Avoid turning your body away or crossing your arms. Lean in towards the other person — if you are sitting, sit up tall and lean forward in your chair. Mirroring/Reflecting: Using similar facial expressions used by the speaker can demonstrate active listening and empathy towards the other person. Focus: Don’t get distracted from what the other person is saying and will stop themselves from playing around with their phone or giving in to distractions. Positive Reinforcement: After a point has been made by the speaker elaborate and explain why you agree with the point they’ve made. Questioning: Asking relevant questions will indicate to the person speaking that you’ve been paying attention and that you’re genuinely interested in what they have to say. Asking helpful questions can help you gather better information and learn more about the other person. By implementing these signs into your listening practice you are on a good way to practice active listening. Once you are paying full attention, this technique will allow you to on the one hand show the other person that you are really paying attention and are interested in what she is saying, and on the other hand, make sure once again that you received the true intention. This technique is called “reflecting back”. When reflecting back, you will repeat back what you have heard in your own words. Repeating what the other person says may sound funny or even annoying to the other person. It can, however, when used correctly yield a very positive reaction and move the conversation forward. The statements don’t have to be perfect, it is enough to focus on the main point of the message. This process is especially applicable in coaching settings. Coaching is more about asking the right questions instead of delivering answers. It is about coaching others to become clear about their true intentions by asking questions, in this case through reflecting back and paraphrasing. In order to communicate effectively in a conversation, it is crucial to focus on dialogue instead of monologue. Monologue is used to make sure you are heard. This might be adequate for giving a public speech. Dialogue, however, focuses on exchanging messages between two or more participants of a conversation and have all parties engaged. By asking questions such as “What do you mean by that?” the transition to dialogue can be made. Let’s stick with this question and take it as an example to show the importance of intonation. Read the question several times and each time put the emphasis on a different word. You will see quickly that the meaning can vary depending on where you put the emphasis on and which part of the word you stress with your intonation. Thus, make sure you use intonation as a tool and consciously put the emphasis on the right part to be in line with what you want to address. For further tips on how to improve your skills as a speaker, check out Julian Treasure’s TED talk. The final piece for effective communication is the development of objectivity. By transcending your own perspective and biases and by being able to look at the conversation from an outside perspective, you can make decisions from a more rational stance and prevent subjective impulses to get in the way. Observer: Taking the role of an outside observer and see the situation from there. By analyzing these three perspectives you can view a past situation in a different light. Firstly, consider this situation from your own perspective. What did you see and experience? How were you behaving and reacting? How were you feeling? Then, move on to the second perspective. You become the other person. Step into her shoes and experience the situation completely from their perspective. What do they feel? Describe this situation as if you were the other person. Finally, try to take the perspective of an observer. Imagine that you're a neutral, third party that is looking down looking down at the situation. What does it look like when you consider things from this perspective? It is only from the third perspective that we are emotionally detached and can be somewhat objective. This will allow you to see your own behavior and its effect on the conversation in a different light. From there you can go on to see where you have still room for improvement to become a better communicator. The key to great communication is to understand that everybody has a different way to make sense of the world. It is therefore important to become a good listener to understand the other person and be able to communicate your own intention effectively. 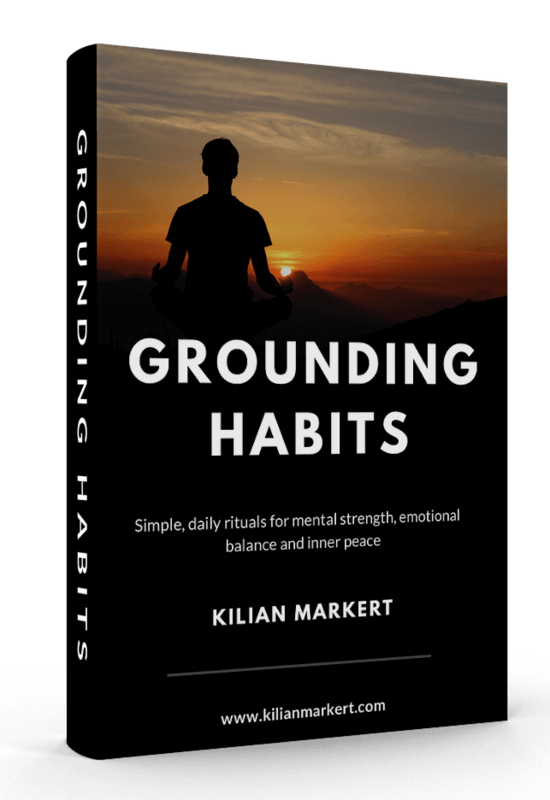 This steady practice will set the foundation for trust, authenticity, improved relationships and thus higher quality of life. This concludes the fifth part of the series “On Coaching Yourself & Others”. Check out the sixth part, which features the topic of Goal-Setting in more detail. PS: What techniques do you use to communicate better? What helps you to be a better listener?